Jesse Michael Gomez, 52, was arrested early Friday morning in a ravine. The suspect arrested in connection to the shooting of two San Diego police officers and a potential suspect were identified Friday. 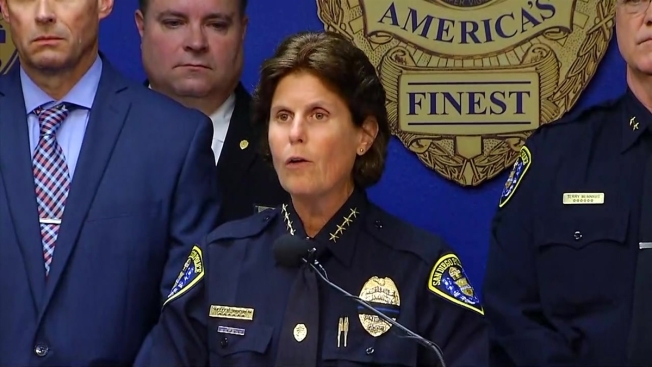 Jesse Michael Gomez, 52, was taken into custody after two police officers were shot, San Diego Police Department (SDPD) Chief Shelley Zimmerman said Friday. Officer Jonathan "JD" De Guzman, 43, a 16-year veteran of the force was shot and killed Thursday night. Officer Wade Irwin, 32, a 9-year veteran is still recovering in the hospital. Both officers are part of the force's Elite Gang Unit. Zimmerman says she visited Officer Irwin and his family in the hospital on Friday. He is now awake and expected to make a full recovery. Police took Gomez into custody shortly after the shooting. He was found in a ravine in the 1300 block of 38th Street, according to Zimmerman. He had suffered a gunshot wound and was in critical condition as of 11 a.m. Friday. Sources have told NBC News Gomez is believed to belong to a local gang. Though Chief Zimmerman said no evidence points to him being in a cartel, the possibility of a gang relation remains open. Zimmerman also named Marcus Antonio Cassani, 41, as the second potential suspect in connection to the shooting. He was arrested on the 4000 block of Epsilon Street Friday morning for an outstanding warrant for narcotics possession. A police spokesman confirmed that investigators are not able to connect Cassani to the crime at this time. He posted bail on Saturday. A man who identified himself as Cassani’s father told NBC 7 his son is not a suspect and doesn’t even know the man facing charges for the deadly shooting.